We hope you enjoy this San Diego Beaches and Adventures website and spend some time in San Diego, but we know you may also enjoy a travel getaway to other California destinations. 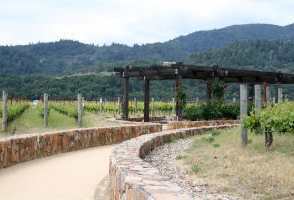 So travel California with some weekend getaways to these other great vacation spots. Some of my favorite California places include Napa Valley, San Francisco, Yosemite, Disneyland, and of course the beaches of San Diego (above photo is a view of Scripps pier in La Jolla and the world famous Black's Beach San Diego). 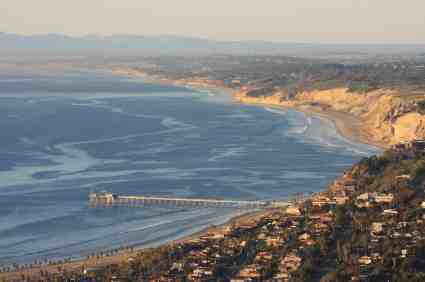 And if you are looking for the scenic route from north to south, you'll love the Pacific Coast Highway. Continue reading for vacation tips and places to see. I love San Francisco, the most beautiful city in the world. 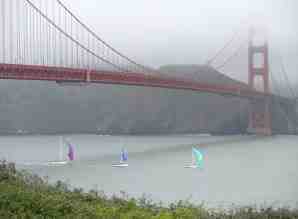 Shown here is the famous Golden Gate Bridge (photo credit Cathy Snider). If you visit Northern California, a trip to San Francisco, or "The City" as it is called by the locals, is a must. It is a warm and beautiful city in the winter, but in the summer be warned - the fog may be scenic over the bridge but "The coldest winter I ever spent was a summer in San Francisco". 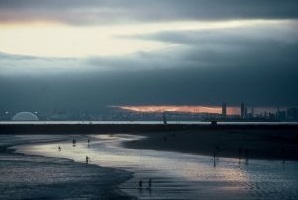 When you visit the San Francisco bay area, check out www.hiddensf.com. This website describes the pleasant, wonderful, magical experiences of SF.! A collection of the best of the best treasures! Yosemite National Park in Northern California is one of the most scenic spots in the world. 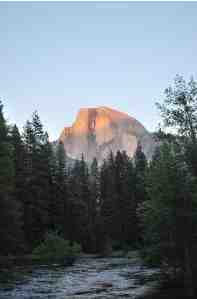 Shown here is a photo of Half Dome in Yosemite Valley at Sunset (photo credit Andy Bollock). If you travel to California you should include a visit to Yosemite. Check out Yosemite California at www.best-california-vacation.com/yosemite for a guide to Yosemite National Park. Enjoy your fantastic journey to beautiful Yosemite, with its granite mountains and beautiful waterfalls. If you've never been to Disneyland, then a visit while you travel California is a treat. Bring a child or two for the most fun, but all young-at-heart adults will enjoy it too. Disneyland is located just a short drive from San Diego, so we've included Disneyland vacation ideas on our website. 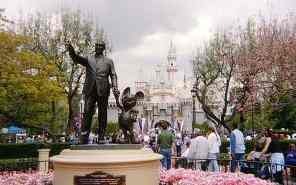 We also have tips on discount tickets to Disneyland, and all the other popular theme parks in Southern California. The Pacific Coast Highway runs along the United States western shore along Washington, Oregon and California's coast. It is a beautiful scenic road to explore. If you have the time, your visit to California should include a stretch of the Pacific Coast Highway. 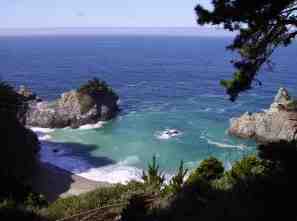 Here's a great website written by two award-winning travel writers about America's Pacific Coast Highway www.pacific-coast-highway-travel.com. Another great way to travel California!